Sarah is passionate about helping people understand themselves and their finances so that they can achieve their personal goals. In 2018, Sarah became the first financial therapist in South Dakota as well as the first person in the country to complete a mental health counseling internship in financial therapy. Sarah began her life career with a passion for analyzing and solving complex problems. She discovered her skills in college as a student of engineering mechanics, using math and science to explain and predict phenomena such as crack growth in a sheet of plastic or sound generated by a fan blade. 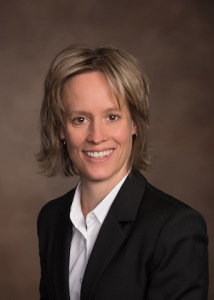 Prior to discovering her love for financial planning, Sarah spent nine years as an engineer with Hewlett-Packard in Boise, Idaho, developing LaserJet printers. In 2009, Sarah started engineering financial plans to explain how all the moving parts of the plan - insurance, taxes, estate, retirement, investments - interact together. Soon after Sarah joined Kahler Financial Group in 2012, she began expanding her career to include the integration of financial coaching and counseling with financial planning. Sarah became a CFP® certificant and the second NAPFA Registered Financial Advisor in South Dakota in 2013. She holds a master’s degree in clinical mental health counseling from South Dakota State University. She also holds a bachelor’s degree in mechanical engineering and a master’s degree in theoretical and applied mechanics, earned at Washington University in St. Louis and the University of Illinois at Urbana-Champaign. Sarah’s passion to help people goes beyond simply helping people with their finances, she served on the board of Lifeways, Inc., a non-profit adolescent substance abuse prevention and treatment agency from 2016-2019 and currently serves on the Financial Therapy Association Board. Sarah and her husband, Rick, moved to Rapid City in 2012. Whether by car, airplane, ATV, or foot, Sarah and Rick enjoy traveling, biking on their new Harley, and being in the wilderness. They are excited to have a new place to explore and enjoy the great outdoor activities South Dakota has to offer. I am the lead link of the planning and investments circle at KFG, which means I am dedicated to the purpose of creating, maintaining, improving and facilitating the delivery of financial planning and investment services for the clients of KFG. I spend about half of my time meeting with clients in a financial planning , financial coaching, or therapy role. The other half of my time is divided among many other activities. One of my main roles is training our resident financial planners and working with them to complete financial planning reviews for our clients. I am heavily involved in the on-boarding process of all new clients, getting to know all aspects of their financial situation and learning as much as I can about who they are, what is important to them, and how they think and feel about money. In my role of financial therapist, I help individuals, couples, and groups explore feelings, behaviors, and thoughts around money and navigate significant life transitions involving finances in some way.